Located in the center of old Tibet Lhasa city, the Jokhang Temple was included in World Heritage list in November 2000 as an extension part of Potala Palace. With an area of more than 25000 square meters, it is the holy of holies for pilgrims who have a strong belief in Buddhism. The Jokhang Temple was founded in the golden age of Tubo dynasty in the seventh century. As the top Tibetan Buddhism Temples in Lhasa, it’s considered to be the most sacred place where the 12-year-old-like Shakyamuni statue have been placed. There is a moving tale about the remarkable statue of Buddha. In the period of the reign of Tibetan king Songtsen Gampo, Tubo dynasty was a prosperous and strong state. In order to make more progress, Songtsen Gampo sent ambassadors to the powerful Tang Dynasty and asked for connections through marriages. Finally, Emperor Taizong of Tang consented to the marriage and sent Princess Wencheng into Tibet to marry Songtsen Gampo. 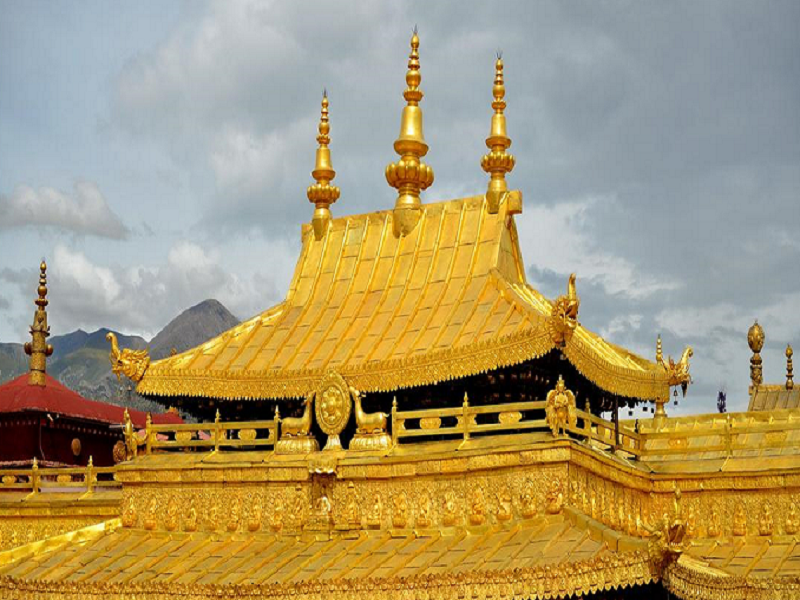 The 12-year-old-like Shakyamuni statue was taken by Princess Wencheng as a gift. From that time, Several structures which are the predecessor of the Jokhang Temple built for placing the precious statue of Buddha. The place where The Jokhang Temple built was a lake in the beginning. Songtsen Gampo made a promise to his another wife Bhrikuti by the lake that he will build a temple where a ring dropped. Unexpectedly, the ring fell into the lake and shining lights suddenly appeared with a nine-story pagoda. So The Jokhang Temple began to be built with thousands of White goat carried soil for the huge project. 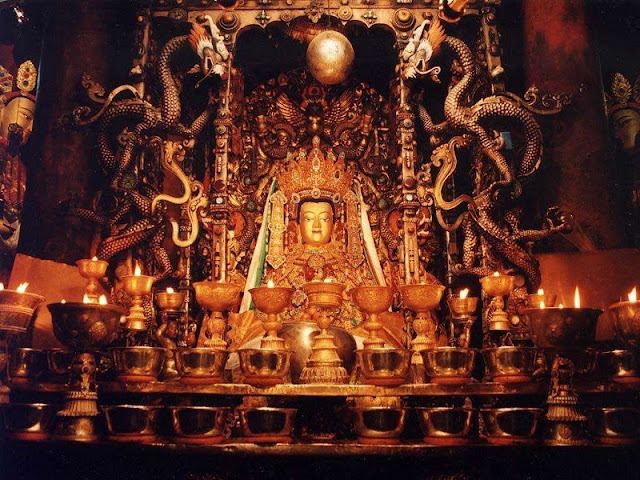 According to the legend, the construction of the Jokhang Temple was interrupted several times due to the flood. 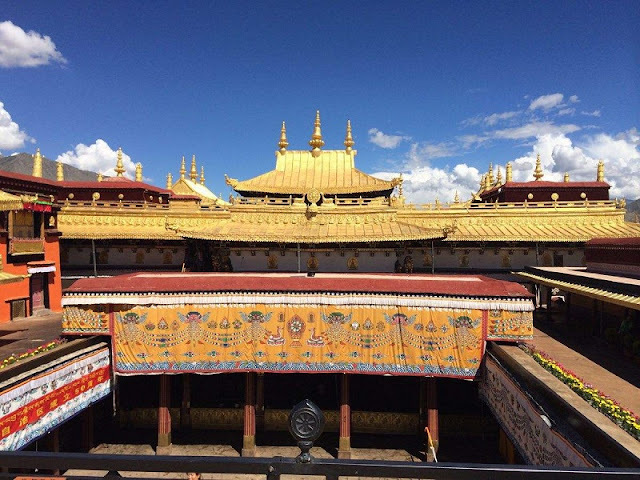 As a knowledgeable woman in many fields, Princess Wencheng explained that the shape of Qinghai-Tibet Plateau likes a witch laying on her back and the place where the Jokhang Temple under construction is the heart of the hag. It’s necessary to remove the lake by filling soil in it and this is the best way to suppress the demon. The main hall of the Jokhang Temple is a four - story exquisite complex with a golden top. Along with the annex buildings, the group of the building shows a mandala with an overlooking. It’s an outstanding structure with the architectural style of blending different elements from Tang Dynasty, Tibet, and Nepal. One can get a view of the whole structure from the square in front of the Jokhang Temple. On the square stand two remarkable monuments. One is the witness in the great friendship between The Tang Dynasty and the Tubo dynasty, the other one tells how to prevent smallpox which was a fatal disease in this land. In the east of the courtyard, there are several rows of Butter Lamp burning day and night. The dancing flame tells a way to the main shrine which has a history of more than 1400 years. There are two statues of Buddha on both sides of the hall. One is the great Buddhist scholar Guru Rinpoche who bring Buddhism into Tibet, and the other one is Maitreya Buddha who is the future Buddha in Buddhism. Sits in the middle of the hall, the statue of Sakyamuni at age 12 could be the most precious treasure in Tibet. Buddhists believe that one can be greatly blessed and free from karma by closing to the incarnation of Buddha.